Lovely sky blue and white clouds. Folks not given to being formal refer to collinsia as Blue Eyed Mary. I love how the little flower head is almost always tilted, giving her a pert look. A neighbor gave me a small start and I had hopes it would spread itself all over the beds in the dappled shade under the tall trees....But, the drought of 2007 was not a good year for anything. Especially, sweet little flowers that wouldn't mind just a bit of moisture! Needless to say, it had a pretty poor showing. So, I ordered seeds from a small nursery in East Tennessee and spread them about the front beds... There were a few more last year...and this past summer I direct sowed even more seeds. Instead it is sprinkled among the various perennials. Seen above with Heuchera villosa "Autumn Bride". 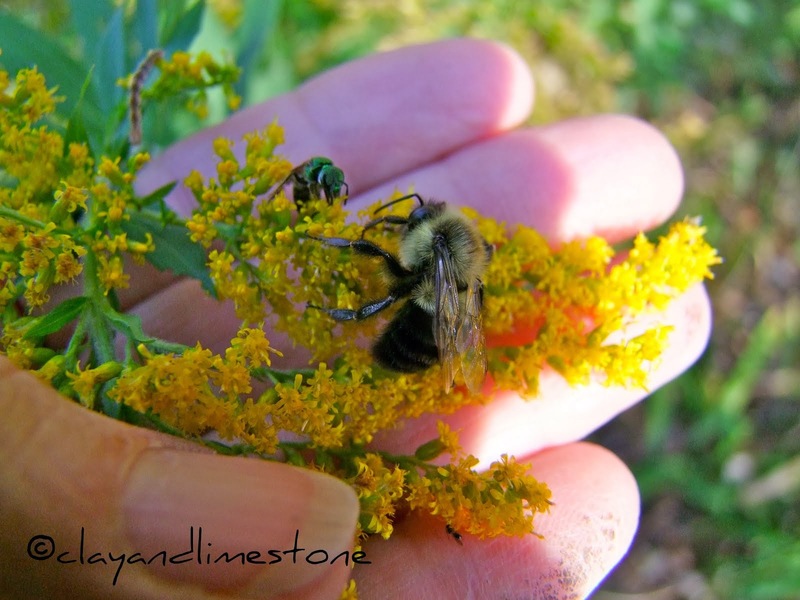 The nectar and pollen of the flowers attract bumblebees and other long-tongued bees. Bees are the primary cross pollinators, so they are very few butterflies and skippers that visit. The flower buds and seed capsules of Blue-Eyed Mary are food for the caterpillars of the butterfly Celastrina argiolus (Spring/Summer Azure). 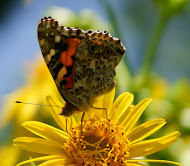 I haven't seen the butterflies yet, but you can go here to see a great photo. Dear friends, I hope you've all had a great weekend and enough time in your gardens. It's going to be another unusually warm day here in Middle Tennessee and with thunderstorms forecast for later this week we'll see a return of the humidity. It must be summer...I've already found ticks! I'm blaming those deer that visited last fall! Have a sweet day~~and thanks for popping over for a visit. Good morning Gail!! Blue eyed Mary is sure a sweet little flower. Wish that was what we had in SC, but don't think it was. Ticks are pretty active both here in VA as well as SC. Pulled two off of me already. Going to be a busy summer of checking the bod for these rotten blood sucking insects. UGH! Such lovely blue! Around here, we call that sky "Carolina Blue" :-). I like your flower blue better. Back to pretty flowers. I thought of you yesterday while walking through the native and endangered plant garden at Duke Gardens in Durham. I'm going to email a photo to you. Carolina blue is allowed in Carolina! Isn't it the prettiest blue! The sky provides endless hours of entertainment! I am totally grossed out by one tick, but 30 is a horror movie! The ticks are bad this year...I am heading over to an outdoor store to get pants that are impregnated with repellent to see if they work...I can't not go into a wooded area! That's a beautiful flower Gail! I could see it naturalized over at Clay and Limestone very nicely. It is just too hot for April. Something is wrong with the thermostat! I have added this plant to my must have list! It is perfect with the lovely shot of your garden and surely matches the blue sky today. What a great post on such a great day! Mary is a sweet little thing Gail! So many lovely wildflowers blooming in your garden. Spring seems to be an endangered species the past couple of years. We seem to go straight from winter to summer here too recently. We've even had 80 degree temps in Chicago the past couple of days. Today it's supposed to be low 70's and stormy here. Ticks - yuk! I found one on my neck last summer. That was the first time I've had a tick on me. Awwww, I love little Mary peeping out from underneath your larger plants. I think that's just perfect! We've had near-100-degree weather here in scenic PA this past weekend, too, with no relief in sight. Ugh!!! The poor daffodils and tulips! As for ticks, having grown up in Nashville I'm conditioned to do a quick "tick check" whenever I return to the house from any outdoor activity. Ticks and chiggers and mosquitos, oh my!!! Jan, That is exciting news about your garden transformation...but not the ticks or the hi temps! I will be sure and pop over to see your lobelia! Dave, it's just not right! 70s yes, hi 80s..NOT. Isn't it a cute flower...you can grow it too! keewee, I love the blue very much and am glad you like it, too! Cindee, There is a native CA collinsia that would be happy in your garden! Monica, Yep, that clay and bothersome critters are every where! Mr I and I were discussing the pros and cons of moving...Sometimes you trade one thing for another! She sure is sweet, Gail, and it's lovely to have those delicate blooms on the ground mirroring the lovely Tennessee skies. Can you believe it's 50+ days until summer? I was sure it was here last week. Tornado and thunderstorm warnings today -- hope we get a little moisture. Linda, I love spring and it is passing too quickly. Maybe it will reemerge after the rain arrives here! The Blue Eyed Mary is a sweet flower...another one that will do nicely in your dappled shade garden! I really hate ticks and it's supposed to be a banner year for them! This is the first year I've seen them here in such numbers! Sigh. Diana, The calendar says 50+ days but we can smell summer here already...and with the thunderstorms will arrive humidity! It's gonna be a hot time in nashville this summer! The skies are beautiful today and the flowers make me smile...I can deal with the summers (new mantra) ...isn't that how we all manage! I wasn't familiar with it but it is very pretty. I love the blue flowers. Happy Monday Gail. You don't have to start seeds indoors when you have such good luck sprinkling them about outside. This is for sure a sweet flower. I'm not familiar with it but I'd certainly like our skies to match her coloring. We have overcast and snow/rain mix (yet again). Seems hard to believe you're hot and have ticks! Kathleen, I wish it weren't so...but it is 82! Do I see decent weather moving into the CS's area of Colorado? You can grow Blue Eyed Mary...search for this one...Collinsia parviflora (Blue-Eyed Mary) Maybe someone in the area will be selling her...she's a native wildflower! You sow the seeds like you do for California Poppy...so there is time for them to grow a bit...then the snow covers them...Nice huh! Thanks for introducing me to a beautiful plant I had not heard of. How'd you get it to match the sky like that ?! Sorry about the ticks, those things creep me out! Collinsia is a beautiful flower, but the name reminds me of the odious churchman from "Pride & Prejudice." It's a lovely little flower Gail. It would look great in your wooded garden. I don't think it would make it down here. I was able to work in the garden most of the day. It didn't reach 80º but it was hot for me. I did manage to get the bed ready for planting of corn & 3 kinds of squash. I just hope it all makes. Gail, this is a new plant to me, but oh how lovely she is. And she is exactly the colors of a spring sky! It looks as though t=you have a good start now and hopefully Mary will spread in your gardens. How long does it bloom? Watch those nasty ticks and hope you have a wonderful gardening week. What a sweet little flower! I am partial to anything blue... I do hope it does better this summer for you and spreads throughout the wooded area. Maybe the rain later this week will help. Love those blue skies! Ours have turned to gray today with more in the forecast for the week, too. Let's hope spring, not summer with its ticks and mosquitos, sticks around a little while longer. Beckie, She's been blooming for a few weeks. A few flowers at a time and now the plants are taller, but the flowers are beginning to diminsh...I am going to pay special attention and try to hardest seeds...Not a detail i am good with, but ...it can't hurt to try! I did read that Blue Eyed Mary is an Illinois native. Those are beautiful flowers - I've never seen or heard of them - and now I defintely want some. That's not being greedy is it? I love Blue-Eyed Mary too. We used to visit a park in PA that consisted of a river bottom with acres of Blue-Eyed Mary. It was so beautiful. I love your shots of Blue-Eyed Mary and of the sky. Lovely! We have had such warm .. HOT ! temps like yesterday .. I was trying to do a plant resuce of some ferns before the contractor comes (he swears this week/end the deck will be up ) .. BIG sigh ! I would love to get Blue Eyed Mary started in our garden. There is a spot in the woods where we walk our dog that has a good stand of Mary. I so enjoy seeing these. Oh My! It does look like the sky! Love that blue in both sky & flower, Gail. You did well to invite sweet little Mary to Clay & Limestone. Years ago, we used to see this wildflower in a couple of parks near Champaign, Illinois, sometimes in company with Mertensia/Virginina Bluebells. MMD is so funny! Knowing real people named Collins saved me from attaching the smug fictional clergyman to 'Collinsia'. I'd love to grow that, both in my own garden and at the gravesite of a dear friend who was a blue-eyed Mary. Could you e-mail me the name of the nursery where you got the seeds? Cindy, I called the Garden center and she said she was not doing the seeds anymore...I am so disappointed...Let's see if I can get the seeds for you from a few plants...Or I can send you a few plants ...If I over night them they won't be so traumatized! Oh, I don't want ticks! I've been lucky the past couple of years with that problem. I love the Blue-eyed Mary flower. I see I can grow it here, so on the list it goes. Reminds me of the little pansies, with their uptilted faces. That really is a beautiful flower. It is so sweet. Looks cool with the sky pictures. I do believe you'll have that field of them that you so desire. And now..we all want one too. This is a new one to me! I'll have to keep my eye out for seeds/plants, because it would do well in the Woodland Garden. ACK about the ticks! I loathe them ... which reminds me we need to get some Frontline+ for Hanna soon. Too bad they don't have a human version that works that well! At least they're not usually a problem here in the city, but out in the country is a whole nother story! Gail, I love they way you began this post with photos of the skies, which lead to these flowers. They are stunning little blossoms, and do indeed resemble the sky! :-) Happy Day!